Today’s adventure games are sprawling, lavish affairs with photorealistic graphics and atmospheric audio tracks that strive to take the player to another place and time. Sometimes it’s hard to tell a modern 3D adventure from a full production film. Things weren’t always like that. 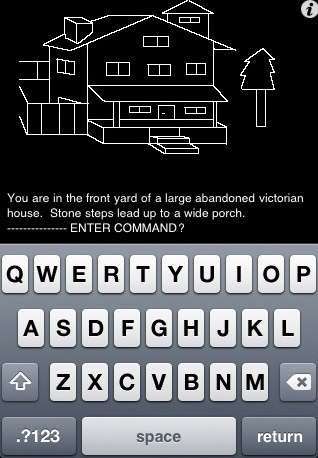 In 1980 Ken and Roberta Williams of On-Line Systems (who later founded Sierra On-Line, more recently known as, simply, Sierra) released an Apple II adventure game entitled Mystery House. 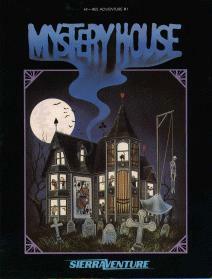 Mystery House is notable for being the first adventure game to contain graphics; previously all adventures were text-only. The game features 70 simple 2D drawings, created by Roberta Williams, that illustrate various locations in the game. In 2007, GamePro named Mystery House the 51st most important game of all time. The game takes place inside an abandoned Victorian mansion. The player is locked inside with seven other people and as he begins to explore the many rooms of the mansion terrible things start to happen and the bodies of the seven–dead–begin to appear. There’s a murderer among them and the player must find out who it is to avoid becoming the next victim. I spent some time with Mystery House on my Apple //c back in 1984. And while even then it looked dated, I recall finding it to be a playable, basic adventure game. Likely most of our readers have never encountered this nearly 30 year old title, but any iPhone gamer who’d like to give it a try can now do so on the go, thanks to Artsiness‘ recently released iPhone adaptation [App Store]. The game is currently being discussed in our forums.